Much of our popular world tries to boil down ideas to top ten lists, black and white, this or that. We love to label, describe, analyse, and understand complex systems in simple terms. Many times people try to nail down the complexity of the human condition and the infinite wonder of our mind, into a textbook, a thesis, a simplified solution set, but there is a negative consequence of only seeing only that side of us. We are magnificent beings, full of mystery yet to be discovered, and I wonder aloud many times, what is it that we need to uncover? What do we need to simplify? What boundaries are we searching for? To what end is the search for limits in a boundless universe? I contend that we are in fact complex, boundless, beings capable of so much more than we could ever imagine. If one person grew up from inception to adulthood with no limits, no records of achievement of other people to box in what we perceive is possible, what would that person be like? How would they talk? how would they act? We spend an inordinate amount of time and energy avoiding fearful events. That may have served us many years ago, and our brain may not have yet evolved beyond it, but are we not holding it there, happy to avoid the fear we imagine? In fact, the avoidance of fear is a pitfall, a trap that will have us looking at the world in an adversarial mindset. It will pit us against them, will strike up negative feelings when the ‘world’ lashes out at us, and we will make excuses for why that happened. We will strive to do better, to be more prepared, to see the causes of that event and prepare against them, expanding our fear, not reducing it. Fear does not like to feel fear, it is afraid of it in fact (see The Untethered Soul by Michael A. Singer, page 71). This struggle in life is one of nonacceptance, of strife, and it is uncomfortable for you and I and everyone around us. We have defined our life by what keeps us safe, and we have missed the bountiful life that surrounds us in its entirety. In our attempt to keep us safe, a seemingly good task, we have doomed us to a sliver of reality and paranoia. One way to release our grasp on the phantom tiller of the ship that takes us through our life’s journey is to let it go. We have no real control what happens to us, so why pretend? When we let go of the sense of control, something wonderful happens: we breathe easier. The tenseness inside us subsides, and colour begins to flow back in to our unrestricted veins. Let me give you a concrete example. Picture a commuter in a car heading to work in the morning. Maybe this is what you do, maybe you get up early to avoid the rush hours, to avoid all the traffic, but for many people in North America it is a daily routine. We spend our lives driving here and there in the most efficient way possible, by finding the best route, by listening to the radio for any accidents or congestion, we may even look at the news before we leave our home for that last bit of info. We are waging a war on the traffic, as if it is an organism that must be beaten every day. We take control with our hands around our steering wheel and weave our journey feeling in absolute control of our route to work. Do you think that person is relaxed or tense? Wouldn’t you rather relax, read the newspaper, and gaze out the window while on your way to work or school? Many people have traded in the commute by car for a commute by train or bus for just this reason. They have decided to move close to work to reduce that stress in their lives. they have decided to give up on that control of holding the steering wheel for an entirely different way to get to work. The feeling when you are a passenger, if you can relax as one, and a driver is completely different, even if you are in the same vehicle. When we get stuck in thinking there is only one way to live, we oversimplify our life’s apparent choices. We tend to work within our self defined limitations without looking at the more holistic view of how we live our life. Feeling fearful and working to subdue the universe in order to ‘feel safe’ is one such journey of holding the wheel of life and creating a binary version of life, when it was meant to be so much more. We are more like this cyclical relationship that constantly changes depending on our present viewpoint and ever-changing perception of reality. How can we contend with the seemingly merciless barrage of feelings that we are subjected to every day? In time the emotions that are most reflective of our inner struggles will stay with us. we need but enjoy the myriad of emotions and bodily feelings that our being was gifted with. We have an incredible diversity of feelings that we need not discern to the nth degree, that we need not understand all aspects about in scientific terms, we need only realise that they are a beautiful readout of where we are right then. They tell us where we are on the journey of enlightenment, like maps to where we could put some thoughtful energy. Do you need to know what a feeling is called in order to feel it? No, you need but sit with it and befriend it, asking yourself why it is choosing to reveal itself to you at this moment. In feeling it, it talks to you and says more than any textbook. We have been given a beautiful array of feedback mechanisms that will guide us to our ultimate destiny if we can see them, feel them, sit and relax with them. In doing so we can be less concerned with how to name them, and more aware of what they mean to show us. I strive to no longer filter my emotions, nor attach myself to them, or hold back what I feel, or try to stay calm in all situations like a stolid silent archetype of days gone by, but as a real, living, breathing human being that is exceedingly open, sensitive, and complex, just like you. Warning: Living this kind of life will take time to master, but it will be joyous, fun, and can bring about the wondrous feeling of the magic of youth! I heard this definition of atonement from Joseph Campbell. It is a critical step to understanding the journey of our self, the hero we always bear within us. The sense of releasing the Ego in order to attain it is fascinating, and it makes this all the more important. The traditional sense of atonement that I think of is one reflective of religious beliefs; an act of atoning for one’s sins. 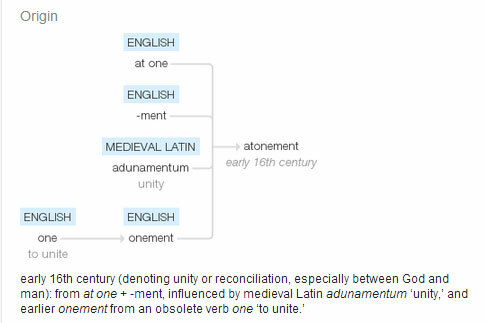 However, when viewed from the origin, or etymology, of the word itself, we can see that it comes from the sense of unity. That may be exactly the same thing, but it feels different to me, probably because I have limited religious knowledge. When I think of reconciliation of a wrong, or reparation, I can see it as an action whereby a person attempts to reunite oneself with the wronged or slighted. To bring us back to the unity of friendship or whatever level the past relationship held. In doing so we see the act in the fullness of a greater lens; a more holistic picture. If we see this as a cycle of the heroes journey, as it relates to this, it is the closing of the circle, the last step to reaching the point where the journey began and the injury was started. In bringing ourself back to this point, we can visually see that we are uniting ourself once again with that person. Our understanding is unified. Atonement not only requires us to review our deeds and actions that may have slighted others, but also our relationship to others, perhaps even what that other person means to us. One reason is accountability. If we cherish a strong moral and ethical character, we must rectify the wrongs we have done. We need to answer for them, so we can close the loop, let those affected by it understand our new intentions, and learn to deal with the next situation in a better manner. It’s growth of character and how we can choose to evolve in to a better person, which serves everyone. Wrongs stick to us. Our past events of transgression, whatever they may mean to us tend to stay with us unless we can clear them by righting them with whom we wronged. By asking for forgiveness from them, they may allow us to let go the sense of negative karma we might feel. Sometimes we can’t let go until the other person says it’s all right and we have made amends. This is likely where the false belief of forgiveness comes in, where we feel we can hold that feeling of negativity with the wrongdoer if we do not forgive them, as if we are casting a spell on them. That is absolutely false. It only enslaves us to the past, and casts our mind from the present at every moment that the environment reminds you of it. The reality is that we can absolve our self if we truly feel we have learned from our wrongs, even if they will not forgive us; we can forgive ourselves. This then means the one that does not forgive only holds on to their dark thoughts and lives clouded by it until they decide release it. To close the circle brings us back to the start, so to speak, of where the wrong happened. By unifying our desire to right our wrong, to bring about personal growth and clarity of purpose, we seal off the deed, closing the file, so both parties can move forward, releasing the mindful links to the past to where it belongs. One important aspect that I think of as I write this is the fact that we have no control over much of our life. The person we wronged may be taken from us, or we may be taken from them at any moment. I’m sure this happens quite often, that we haven’t made peace with our neighbour, our friend, our parent, our sibling, or loved one. If you are holding on to a sense of anger, hurt, jealousy, or any other poisonous emotion toward another person, who is it serving? If you have some acts that you need to release, seek those you may have hurt out. Become one with them by a shared understanding to end all sense of conflict and move forward, before the opportunity escapes you forever. At one ment is a beautiful word. Unity, to unite, to close the loop, this satisfies our brain and allows us to progress in the present moment, unencumbering our minds from the past. It’s a beautiful, freeing process.